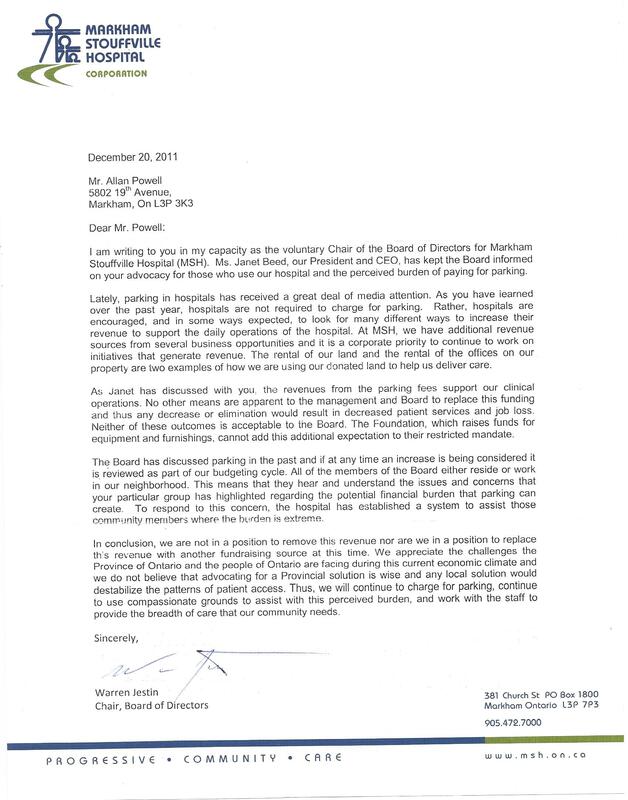 In late December, 2011, we contacted Markham Stouffville Hospital with a view to talking to the MSH Board chair. We hoped to meet with the Board to explain the issue of high and rising hospital parking charges and to seek the support of the Board. The initial response was a phone call from Janet Beed, CEO of the MSH Corporation, who declared that the Board knew all about the issue and that a representation from our group was not necessary. While we actually sympathize with this position and believe that the solution to the matter of high and unchecked parking fees in our hospitals does not lie with individual hospitals, we had hoped that MSH would take the high road and offer at least moral support for our campaign. This is a dissappointing, although not unexpected, development. We are further encouraged to take this discussion to the highest level. We will renew our efforts to meet with the Minister of Health, Deb Matthews, to gain a full understanding of where the responsibility for the impostion of parking charges on a vulnerable patient population lies. Passing the buck from Hospital to LHIN to Ministry does not serve the public well. This strategy only serves to continue unchecked the stress on those in society who can least manage it: the sick, the old, the poor and those who would seek to support them.